The noise, my dear, and the people! I ran over Seaford Head, a familiar route of a little over four miles. It was not a run of any great significance in athletic terms, but from an anthropological point of view, it was momentous. While, when I usually follow this route, I meet the odd dog walker, maybe another runner or cyclist, today a a beautiful hot August day had brought every sort and condition of man and woman to Seaford Head. There were language school students, selfie sticks carried on their shoulders like a marching column; I heard Korean, Japanese, Polish, and other tongues I didn’t recognise. These walkers saw a slow runner, in late middle age, struggling up the long hill from Hope Gap to Seaford Head. I don’t really care. Onwards, ever onwards: I have before me the three races of the August Bank Holiday weekend, to wit the Alfriston Water Meadows run, the Newick Will Page 10k and the King's Head Canter (that's the one with free beer), followed by the Hellingly 10k in mid-September. 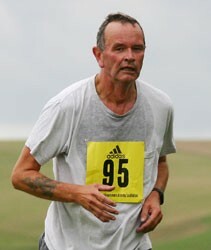 My autumnal climax will be the Lewes Downland Ten Mile.